WASHINGTON D.C. — Legislation that allows the lethal taking of sea lions that prey on at-risk fish populations on the Columbia River and select tributaries in Washington, Oregon and Idaho has been signed into law by President Donald Trump. The bipartisan bill, co-sponsored by Sen. James Risch, R-Idaho, and Sen. Maria Cantwell, D-Wash., makes slight changes to the Marine Mammal Protection Act of 1972, which lays out prohibitions for killing marine mammals, and institutes a permit process for the lethal taking of sea lions. Permit holders are legally allowed to kill sea lions that are part of a population and/or stock that is not classified as being depleted or at risk. The signing of the bill by President Trump was the culmination of years of hard work and advocacy to bring attention to the issue. Moses Lake resident Rick Graser, who spent 31 years as a fishing guide, was at the forefront of the fight for a fix to come about and says he is relieved to see it come. But at the same time, he says, it could have come sooner. In order for a sea lion to be eligible for lethal removal the animal must have been previously captured and branded by a fishery, have been observed for at least five days on the river and must have been subjected to hazing techniques and been observed eating a salmon or steelhead. “The way the fish runs have gone down and the damage these sea lions have done it is going to take years to repair the runs to where they were before the sea lions showed up,” Graser said. The U.S. Army Corps of Engineers has been keep statistics on sea lion predation on salmon/steelhead directly below Bonneville Dam in Washington from January through May each year since 2002. California sea lions have been migrating north from California since the mid-1980s and their numbers have varied over the years, but during the 16-year time span almost 4,000 fish have been consumed by the animals each year below the dam. Estimates put the total number of wild salmon populations in the Upper Columbia River and Snake Rivers that are at risk of predation by sea lions below the dam at 32. U.S. Rep. Jaime Herrera Beutler and seven Southwest Washington state lawmakers have written to Gov. Jay Inslee asking him to “keep mass transit alternatives to light rail on the table” as part of negotiations to replace the Interstate 5 Bridge across the Columbia River. The letter was prompted by news last week that Inslee included $17.5 million in his proposed budget for a project office to replace the I-5 Bridge. The budget item included language that light rail would be part of the project. He also made remarks to The Columbian that including the means of transit on the bridge would signal to Oregon Gov. Kate Brown, who has insisted on light rail on a replacement crossing, that Washington would be a partner on the project. Inslee also said that the budget item would convey to the federal government that an actual project is in the works. “We all agree on the pressing need to address the congestion and safety issues at the current I-5 Bridge, and it’s imperative that we all work together on a long-term solution that both sides of the river can support,” reads the letter that was also signed by Sen. Lynda Wilson, R-Vancouver; Sen. Ann Rivers, R- La Center; John Braun, R-Centralia; Rep. Paul Harris, R-Vancouver; Rep. Brandon Vick, R-Felida; Rep. Richard DeBolt, R-Chehalis; Rep. Ed Orcutt, R-Kalama. 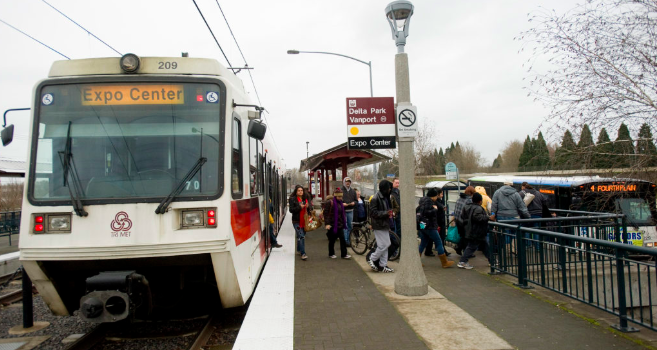 The letter cites three advisory votes, most recently in 2013, where a majority of Clark County voters expressed opposition to extending light rail to the county. Last week, a bistate committee formed to look into replacing the bridge met for the first time with Oregon lawmakers. Wilson, Rivers and Orcutt are serving as members of the committee. “It’s not just faithful representation that demands we remain open-minded to transit alternatives, it’s also practical politics for those of us who actually want to solve the problems on the I-5 corridor,” reads the letter. The letter states that the Columbia River Crossing failed “in large part due to the insistence of politicians and bureaucrats” that the project extend light rail to Clark County. “Those who refuse to learn from history are doomed to repeat it,” reads the letter. Since Washington lawmakers began seeking to restart talks with Oregon about replacing the I-5 Bridge, most of Clark County’s legislative delegation has expected that mass transit will be included on the new crossing. There’s also broad support among the county’s delegation that bus rapid transit would be an acceptable option. Rep. Jaime Herrera Beutler, R-Battle Ground, said it’s certainly more fun to be in the majority, but as she prepares to enter her fifth term in Congress as a member of the new minority party, she isn’t worried about her effectiveness. She cites December as proof. Four of Herrera Beutler’s bills passed the House or were signed by the president last week. All relied on bipartisanship. A bill to allow fisheries managers and Native American tribes to kill problematic sea lions on the Columbia River, for example, took 12 years to pass. Herrera Beutler said when it finally moved out of the House, she and co-sponsor Rep. Kurt Schrader, D-Ore., exchanged hugs. A willingness to cross the aisle is how all members of Congress should approach their jobs, Herrera Beutler said. A specific plan of action is yet to be determined. Many of the bills that moved forward at the end of the session represented the remaining issues outlined in prior work sessions. Herrera Beutler said she plans to formulate a new plan in 2019, but expects to continue working on similar issues. Making it easier to travel on airplanes with breast milk, for example, was a relatively easy fix that made parents’ lives easier. Facilitating a replacement Interstate 5 bridge is also on Herrera Beutler’s mind. She plans to continue encouraging relationships across state lines, especially at the local level. “But I was saddened when I saw (Oregon Gov.) Kate Brown comment ‘my way or the highway’ with light rail,” she said. Bus rapid transit, however, is a viable option for Herrera Beutler. And when it comes to Oregon’s plan to toll parts of Interstates 5 and 205, Herrera Beutler said Southwest Washington residents need to benefit if they end up paying tolls. “I won’t yield on this,” she added. Going into the 2019 Congress, Herrera Beutler will be the only Republican congresswoman of color. 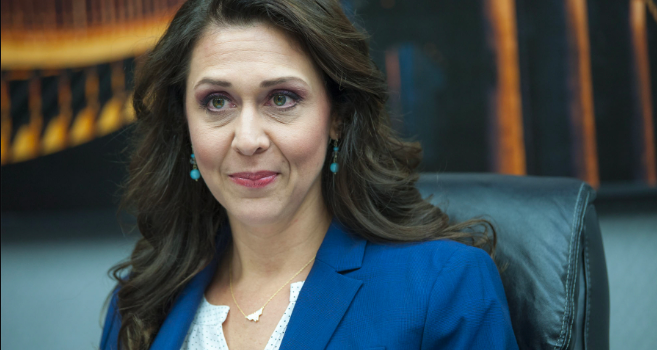 Although the fact was a little surprising, Herrera Beutler noted she’s also the first Hispanic Washington representative to serve in the U.S. House. But she doesn’t feel that she’s been elected in the 3rd Congressional District because of her ethnicity. Although there’s plenty to consider heading into a new Congress, leaders recently paused to honor former President George H.W. Bush. Bush died Nov. 30, and on Dec. 3, his coffin arrived at the Capitol, giving lawmakers a chance to pay their respects. Herrera Beutler said she almost didn’t make it to the ceremony but in the end is grateful she did. As she recalled watching the living former presidents enter the Capitol Rotunda, Herrera Beutler said she couldn’t help but reflect on Bush’s integrity. The acrimony and hostility between the parties needs to change, Herrera Beutler said. Rep. Jaime Herrera Beutler, R-Battle Ground, is seeing momentum on several of her legislative priorities as Congress wraps its term. On Tuesday, Dec. 11, President Trump signed into law Herrera Beutler’s bill to repeal the ban on distilleries on tribal land. That bill was prompted after the Chehalis Tribe sought to build a distillery, before learning that an antiquated law blocked them from moving forward. “This is a good day for tribal members who can now expand economically in the distillery business and bring new skills training and jobs to our region,” Herrera Beutler said in a statement. The bill garnered wide bipartisan support in the House and Senate, passing by voice vote in both chambers. Another long-term priority of Herrera Beutler’s, a bill to prevent maternal deaths, passed the House on Dec. 11 by voice vote. That bill will establish state committees to review pregnancy-related deaths, with the goal of learning and preventing the causes of maternal death. A companion bill to the one that passed the House has been filed in the Senate, but it’s unclear if it will be brought up for a vote before Congress goes home for the year. Another bill pushed by Herrera Beutler won approval in the Senate on the 11th, allowing for the killing of some sea lions that have devastated salmon runs. The bill, which passed the House in June, changes the Marine Mammal Protection Act to allow tribal members and fish managers to obtain permits to kill sea lions, not exceeding 10 percent of the annual potential biological removal level for the animals. Due to some differences in the House and Senate versions of the bill, the chambers will have to reconcile the legislation before it heads to the President’s desk. Joining Herrera Beutler’s flurry of victorious press releases last week was the announcement that the ACE Kids Act she co-sponsored had passed the House. The bill, which was rolled into a larger Medicaid improvement measure, creates networks to coordinate care for children on Medicaid with medically complex conditions, easing options for their families and allowing them to seek treatment across state lines. VANCOUVER – In a poll conducted by the New York Times in Southwest Washington’s third congressional district, Congresswoman Jaime Herrera Beutler is leading Carolyn Long 48-41%. The survey of 497 voters is the only independent public poll to date in this race. It was conducted via phone from October 14-19. Detailed results are available here. Long has repeatedly called for a single-payer government healthcare takeover (aka “Medicare for All”) which could require doubling all federal income taxes. Carolyn Long has repeatedly called for the complete repeal of the tax cuts passed last year, including the tax cuts that save Southwest Washington middle income families more than $2,300 per year. 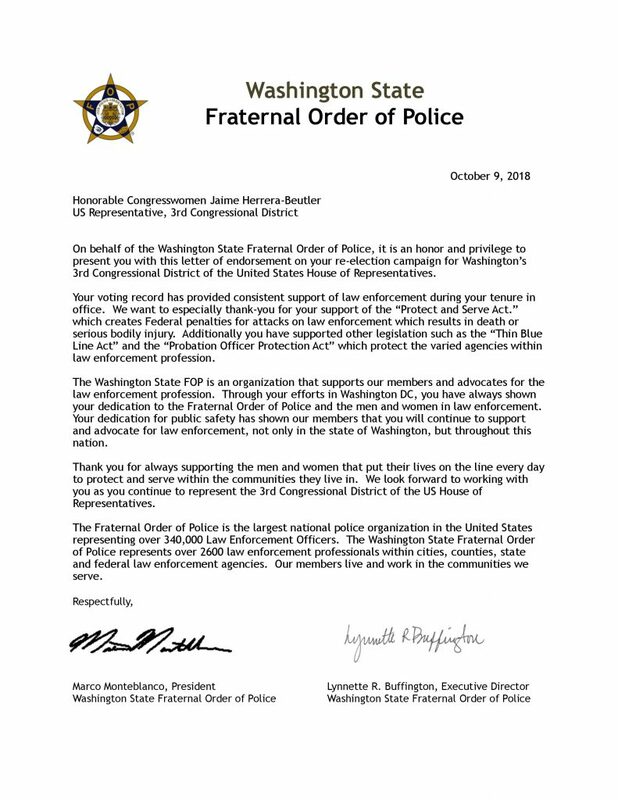 Vancouver, WA – Jaime Herrera Beutler today announced that her campaign has earned the endorsement of the Washington State Fraternal Order of Police (WAFOP) – the state chapter of the nation’s largest law enforcement organization representing 2,600 police officials in Washington alone. Vancouver, WA – This week, Carolyn Long launched a campaign attack ad suggesting drug company money is influencing Jaime’s actions in Congress. Carolyn Long’s family’s livelihood comes from the success of drug companies; her husband is a pharmaceutical sales representative for Sanofi-Aventis. Their family’s pensions worth between $30,000-$100,000 are with Pfizer and Merck – two of the largest pharmaceutical companies in the world. In the required financial disclosure form, Long refused to list the level of her husband’s income from drug sales. “Jaime Herrera Beutler took $56,000 from drug companies, then voted with them to raise prescription costs.” The ad cites Jaime’s vote to repeal Obamacare in January of 2011 as evidence – legislation she pledged to oppose before even running for Congress and a vote she took before virtually any of those campaign contributions were made. “Carolyn Long is the worst kind of hypocrite if she’s going to try and make this race about the influence of drug money, since drug money helps pay her family’s mortgage and is feathering their retirement,” said Jaime for Congress campaign manager Parker Truax. “While our campaign’s advertising had been focusing on candidates’ differences on the issues, Professor ‘Civility in Politics’ Long just accused Jaime of taking legal bribes. The problem is, Long went after Jaime on ties to an industry that sends checks to the Long family mailbox.